Game of Thrones Video Slot is based on the best-selling book series and is available in two versions – one consists of 5 reels and 15 pay lines and the other consists of 5 reels and 243 ways to win. Baratheon House, Lannister House, Stark House, Targaryen House, Coat of Arms and Abstract icons. In the 5 reel, 15 pay line version bets range from 15p up to £15 while the bets in the 15 pay line and 243 ways to win range from 30p up to £6 per spin. The Iron Throne icon is the Scatter and by getting two of them player will win a random cash prize. By getting three or more Scatters players will get four types of bonuses that are linked to the 4 houses. 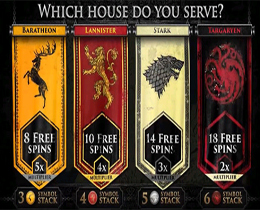 In the Free Spins Feature players have the opportunity to serve one of the 4 great houses of Westeros. Baratheon House (Ours is the Fury) - offering 8 Free Spins with a 5x Multiplier. Lannister House (Hear me Roar) - offers 10 Free Spins with a 4x Multiplier. Stark House (Winter is Coming) - offers 14 Free Spins with a 3x Multiplier. Taragaryen House (Fire and Blood) - offers 18 Free Spins with a 2x Multiplier. 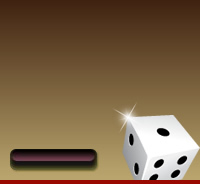 Each house also comes with their own unique Free Spins, Multiplier and Stacked icons.